This large ribcage tattoo honors the connection between the tea plant, camellia sinensis, and your cuppa, creating a chain linking the plant, a tea bag, and a tea cup. Ink this large design down your side, on your leg, or down your arm if you never want to be without your favorite brew. 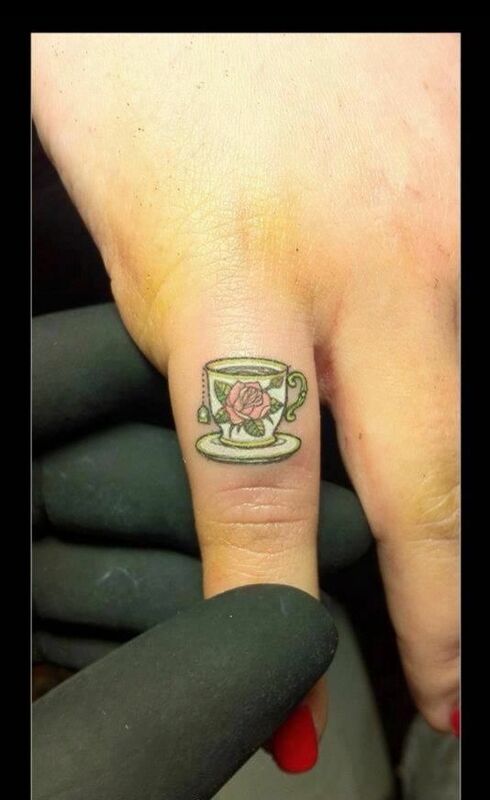 This tattoo cleverly imitates the ring your teacup may leave on a table. 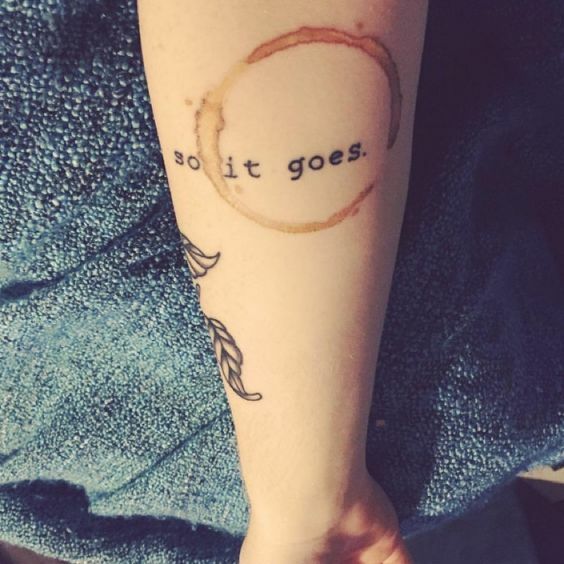 Coupled with the phrase “so it goes,” this design reminds you and an observer that nothing in life goes according to plan, that even alongside the most delicious beverage, there may be a stain. But that’s life. Ink this tattoo if you need a daily reminder not to sweat the small stuff. This cute couple tattoo celebrates you, your significant other, and your mutual love of earl grey, rooibos, or matcha. 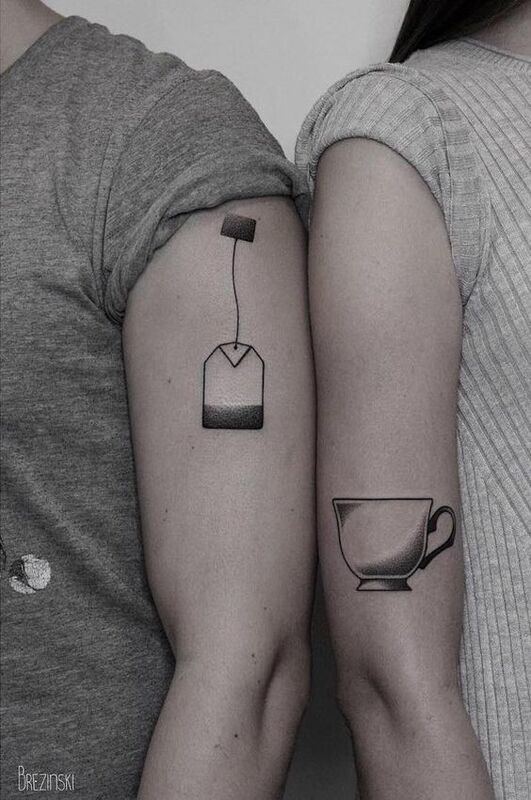 If your relationship has deepened by comparing childhood stories, sharing dreams, and building trust over countless cups of tea, this is the perfect two-part tattoo for you and your love. 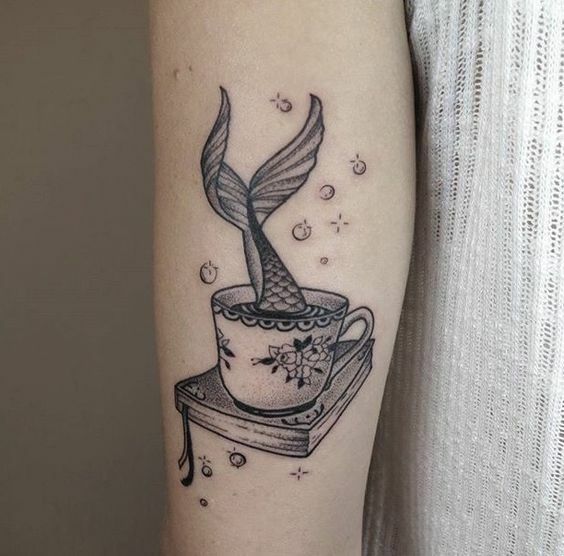 This tattoo is perfect for the bookworm and tea lover known to “dive” into a world of mermaids and make-believe while nursing a hot cup of tea. This tattoo will remind you to take time to escape into a beautiful world of fiction now and then. Doing so may even help you understand the “real” world better. This tattoo conjures the history of the tea industry, when the East India Company drove the global trade of tea in the 17th and 18th centuries. This tattoo interestingly merges a European teacup design with a Japanese-inspired wave made famous in Japanese woodblock paintings, artistically communicating the mashing of cultures that accompanied the global tea trade. 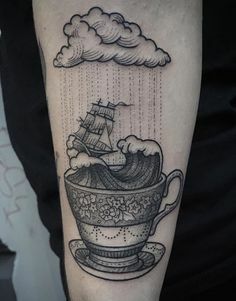 It also refers to the idiom “tempest in a teacup,” used when someone’s exaggerating or “making a mountain out of a molehill.” If you need a reminder not to make a big deal out of small things, this tattoo’s for you. 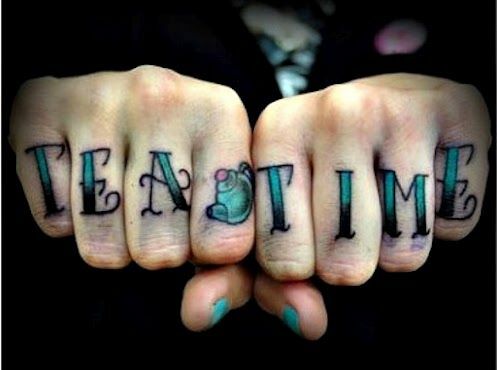 This knuckle tattoo is probably the least aggressive knuckle tat you’ll ever find. Written in classic tattoo lettering, this tattoo will remind you that it’s always a good time for tea. 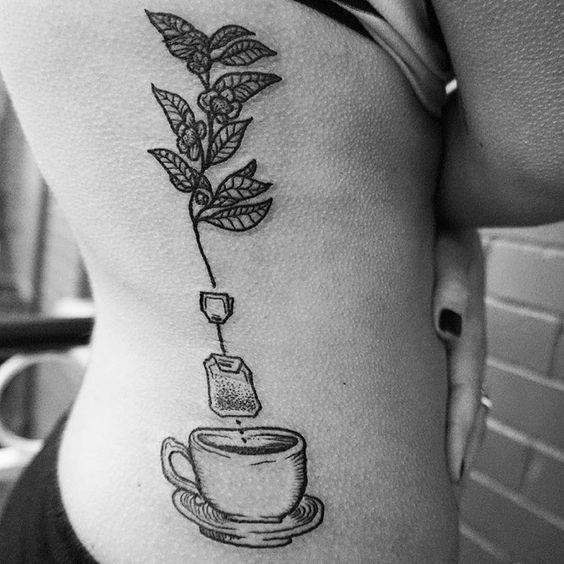 This Alice in Wonderland-inspired tattoo is perfect for tea-loving fans of the famous novel. 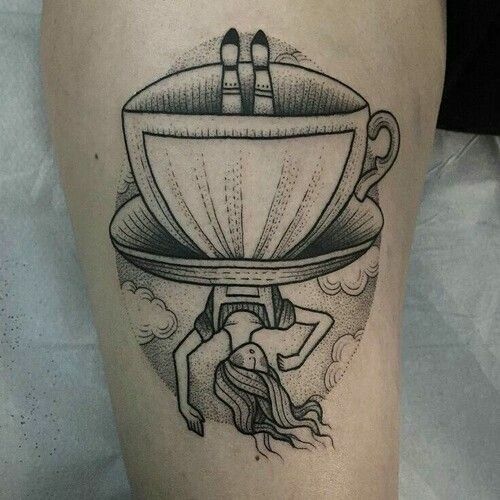 The design features Alice falling into a teacup, perfect for the literary nonsense genre to which the book belongs. 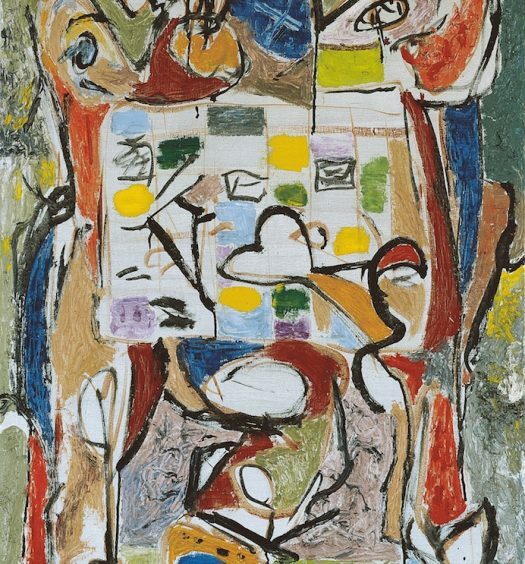 Depending on who’s looking at this design and from which angle, either Alice or the teacup will appear upside down, encapsulating the idea that perspective dictates truth. 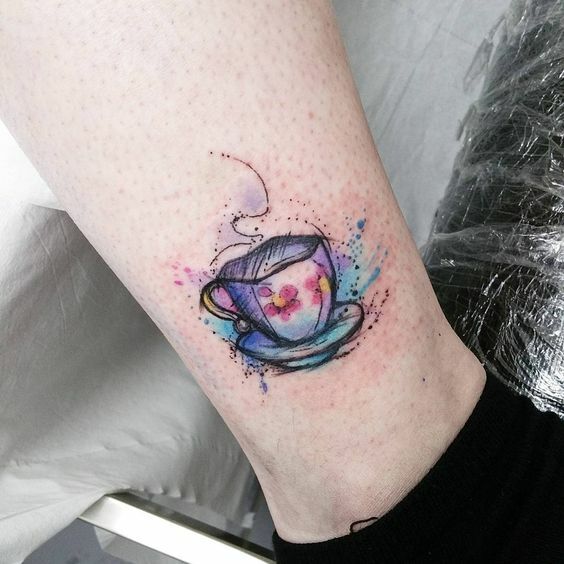 This watercolor teacup tattoo follows the watercolor trend currently having a moment. Great if you want a pop of color with you always. This tiny tattoo is the perfect choice for a pinky. It’ll remind you to raise your pinky if you want to look super classy whilst drinking your afternoon cuppa, and will keep any minimalist happy. 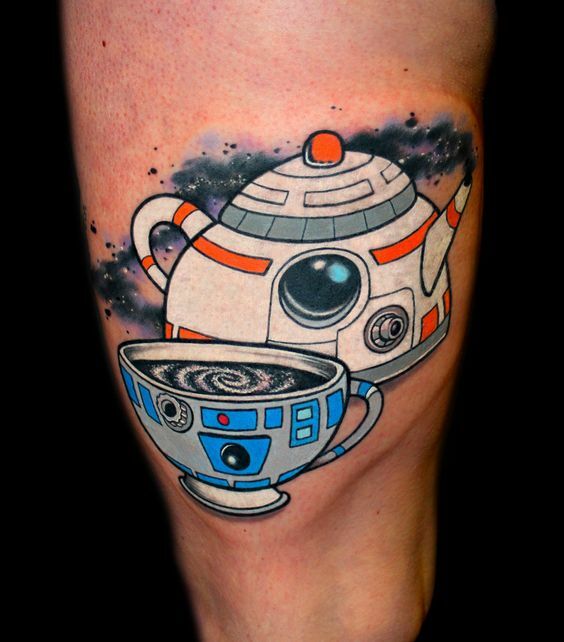 And lastly, this Star Wars-inspired teapot and teacup design is the perfect tattoo for Star Wars geeks who think tea is a jedi-approved drink. Choose this tattoo, and the force will be strong with you.